Reflecting exquisite water views from its sensational riverfront position, this prized family home is arguably Mirvac's most impressive design. Conceived with state-of-the-art inclusions and extensive floor to ceiling glazing over a 470m2 expanse, this concrete construction delivers an exquisite residence of versatility, sophistication and superb alfresco entertaining space. Exceptionally well-positioned within a private riverfront enclave, its faultless demonstration of architectural ingenuity sees soaring square-set ceilings, abundant natural light, an uplifting sleek colour aesthetic and contemporary appointments fuse effortlessly together to ensure a seamless indoor/outdoor entertainer's lifestyle. 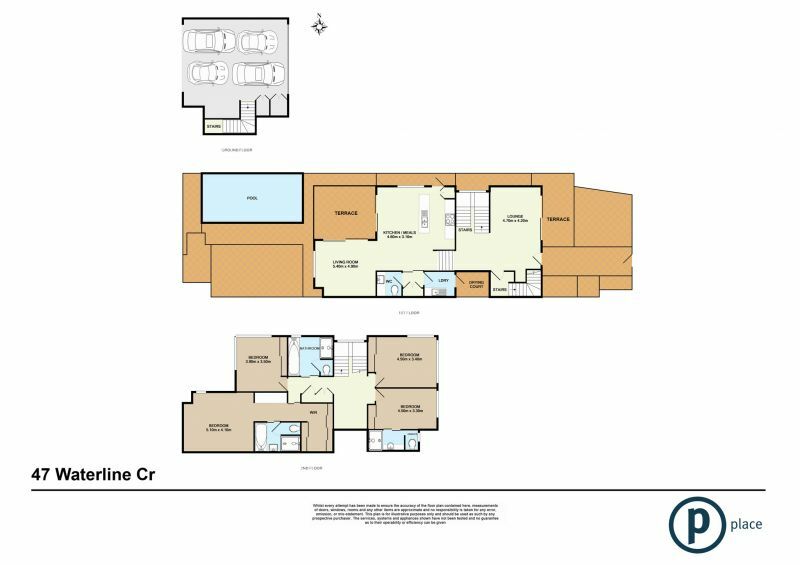 A fuss free open concept layout provides separation and practicality whilst embracing the picturesque riverfront panoramas and district outlooks across three quality finished levels. The home's gourmet kitchen is sure to cater for discerning chef's with its unique layout comprising a range of Miele European stainless steel appliances, array of stone bench tops, sleek white cabinetry and soft closing drawer space. Uncompromised in quality, its central position adjoining the industrial Daiken ducted air-conditioned living and dining space opens out through double glass sliders to reveal a timeless outdoor alfresco entertaining terrace and magnificent swimming pool. Indulge in some quality relaxation time here whilst soaking up the blissful Brisbane sunshine or spend quality family time together, this captivating space exudes designer appeal. Revealing high end finishes over an impeccable private layout, each of the property's four large size bedrooms are serviced by a large family bathroom where the lavish master retreat and guest bedroom delight in their own private ensuites. A sprawling garage accommodating up to 5 vehicles, a 7 camera security system, alarm and full fencing, smart wiring throughout, a watering system and landscaped gardens complete the extensive list of inclusions of this outstanding family residence. Located in leafy, sought after Bulimba, just 3 kilometres from the Brisbane CBD, buyers will be captured by the exceptionally peaceful street and private position secured. Just a leisurely 300m stroll to cosmopolitan Oxford Street, which is well renowned for its boutique shopping and trendy dining scene, this centrally positioned residence is also placed within easy reach of Ferry and Citycat terminals and bus stops ensuring an effortless commute to the CBD and surrounds. Acquiring an enviable stretch of the iconic Brisbane River with views extending over New Farm, Newstead and Teneriffe, its location affords close proximity to educational institutions, local parks, sporting clubs and Hornibrook Park. Awarded an array of HIA QLD Building Awards, this stunning display of architectural excellence offers a privileged waterfront lifestyle of luxury family quality. Don't miss this unparalleled opportunity to acquire the pinnacle of modern design today. Inspect now!